Independent Speech and Language therapist, Jacqui Wright, has over 22 years experience in South Africa, the U.S.A. and the UK. She is author of ‘Cracking the Literacy Puzzle’, RCSLT Bulletin, March 2006. Here, Jacqui from Childhood Communication Consultancy, based in Carlton, discusses Autism and Asperger’s Syndrome. 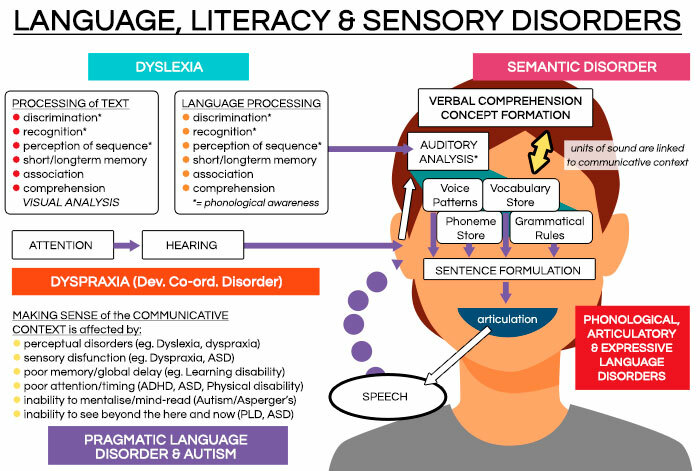 There is an overlap of difficulties between the disorders: ADHD (attention deficit hyperactivity disorder), language and semantic disorders, dyslexia, dyspraxia, pragmatic language disorder (how language is used in context), autistic spectrum disorders and Asperger’s syndrome. Social communication difficulties: ranging from non-verbal to verbal abilities but with no or poor understanding of other people’s body language, emotions, ideas, and the child takes language literally i.e. ‘Pull up your socks’ – means do that action and not ‘do better’ as the idiom is intended. Social interaction difficulties: it is difficult to initiate and sustain a social relationship; there appears to be indifference and aloofness. As social situations are hard to ‘read’, the child acts in ways that seem inappropriate. Social imagination difficulties: there is rigidity of thought and behaviour, and limited imaginative play. The child may carry out ritualistic actions or focus on minor details e.g. lining up toys or focussing on a part of a toy rather than the whole. Asperger’s syndrome has been viewed as a less severe form of Autism on the Austistic spectrum continuum, and more recently as a separate condition in its own right. However, there are similarities and overlap between both. Children with Asperger’s syndrome have relatively good expressive language and average to above-average cognitive scores, whereas Autism is related to language and learning difficulties. Diagnosis of Asperger’s syndrome is often only made after 5 years of age when the difficulties in social communication, interaction and imagination become more apparent. Motor skills difficulties (dyspraxia) or ’clumsiness’ is also common with Asperger’s syndrome. The nature of the Autistic spectrum continuum including Asperger’s syndrome means that children can range from requiring specialist care and provision to being successful in mainstream education, and in later adult life. This highlights the importance of individual assessment and intervention planning; not making assumptions or generalisations about individuals’ behaviours, skills and future prognoses, if they receive this diagnosis. The causes of Autism and Asperger’s syndrome are still being investigated. Further information can be found on the website for the National Autistic Society www.autism.org.uk If all the diagnoses for Autistic spectrum disorders and Asperger’s syndrome are put together, 1 in 100 people are affected in the UK. Theory of mind deficit: the child cannot easily understand the feelings, knowledge or beliefs in other people, which adversely affects social communication. Stimulus over-selectivity: responding to a part rather than the whole, or the whole social situation rather than an individual, which adversely affects social interaction or social imagination. Central coherence is limited: inability as above and to read contexts or generalise tasks across contexts. Lack of gaze monitoring: an absence of joint attention by the speaker and listener on the same object at around 18 months and poor eye contact in joint communication would be an early indicator of social communication and interaction difficulty. Concreteness: not being able to see toys or objects as representations of other things i.e. cardboard tube can be used a telescope, which adversely affects social imagination. If you would like to know more about Autism and Asperger’s syndrome relating to your child or any aspect of communication, please contact Jacqui. There is a talk at Jacqui’s practice on Dyspraxia on 6th October and Dyslexia on 13th October for parents and professionals, please refer to OVL diary dates. Jacqui is an Authorised Provider of The Listening Program www.thelisteningprogram.com and she is trained in Talk Tools www.talktools.net In the next OVL , Jacqui will further discuss strategies to support children with Autism and Asperger’s syndrome.